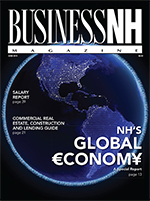 Business NH Magazine's Annual Salary Report breaks down the wage gap, explores the salary transparency trend and the highly educated low income NH population. First Person Look at Canada-New Hampshire trade missions. Health Coaches – Helping businesses control chronic health costs.